Imagine asking your father who works abroad for an 18th birthday present, so he sends one, but you’ve turned 20 and you still haven’t held that gift. It never even reached your house. Cargoes lost in transit is no uncommon occurrence. For cargoes shipped by sea alone, there are around 5 million shipping containers transported across the ocean. Of these millions of containers, thousands are lost before they reach their destination. Land and air shipment industry is facing the same problem. But the fate of the cargo isn’t something you don’t have control over. Whether you are the supplier or the receiving side or the transporter, there are things you can do to prevent cargo loss. One of which is ensuring the packaging is secure and the product is placed in a container suitable for the type of goods you’re trying to transport. Another is to observe proper labeling. One has to make sure that all pieces of information are accurate and up-to-date especially the address. Apart from all these measures, there’s another surefire way to prevent freight from getting lost: GPS delivery tracking. Modern technology has become so advanced that we now rely on every product to get our tasks done easier and faster and with precision. Just like how GPS tracking has been helping freight forwarders and logistics managers ensure a smooth-flowing transfer of goods from the supplier to their respective clients. Freight forwarding involves more than just shipping goods. GPS package tracker is here to help protect cargoes by providing its real-time and accurate location. By knowing the location of the cargo, you can determine the estimated time of arrival and share the information with those involved in the process especially the receiving end. And with the real-time location data, you will know where the cargo is in the event that it ends up someplace that is not part of its intended route. Every GPS tracker in the market today comes with its own set of features all aimed at making sure your cargo arrives at its destination on time and in one piece. But as to how accurate the information you can gather from the tracker depends on your choice of device. 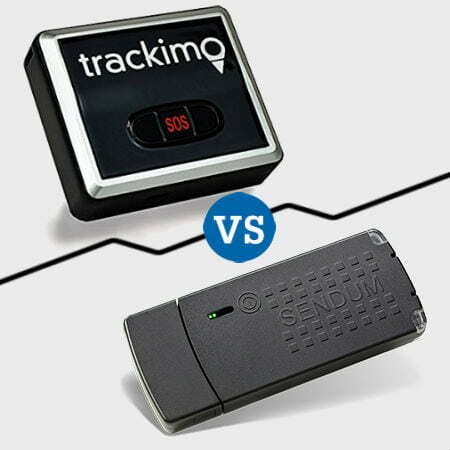 Two of the talked-about package trackers today are Trackimo GPS tracker and the Sendum PT300. Both the Sendum PT300 and Trackimo GPS package tracker boast a set of features that help you keep a closer eye on your cargo. Both have excellent real-time tracking ability, has a worldwide coverage, and a battery life that lasts up to twenty-one days. Trackimo and Sendum can be used to track the whereabouts of goods transported by land, sea, and air. While both are a helpful tool in cargo tracking, Trackimo and Sendum PT300 differ in many ways. Trackimo’s edge over Sendum’s tracker lies in its wider coverage, Web portal interface, weight, and many others. Trackimo is feature-packed but comes in a design that makes it easy to hold and hide. It is small (1.8 x 1.6 x 0.7 in) and lightweight, weighing only 39 grams compared to PT300’s 100 g weight. Additionally, Trackimo’s Web portal is easier to navigate, and the information you need can be easily found on the site. Same goes with the device’s phone applications. Trackimo comes with five tracking modules (GPS, A-GPS, GSM, Wi-Fi, and Bluetooth) compared to PT300’s dual mode (CDMA and GSM). Trackimo tracks down the paths taken by vehicles, boats, and planes, making it a more preferable tracker in the delivery business. One of a carrier’s biggest fears is force majeure. When a problem is something that cannot be foreseen, no amount of preparation is ever enough. When the object tracked are submerged in water or somehow become wet, tracking is almost impossible. Trackimo is very aware of this possibility, that is why the brand’s GPS trackers come with waterproof micro cases and boxes. These cases have tight latching and rubber liners that help protect the item from being exposed to water. With all these features, you would expect Trackimo to be sold at a higher price compared to the rest, but that’s an assumption we never planned to live up to. 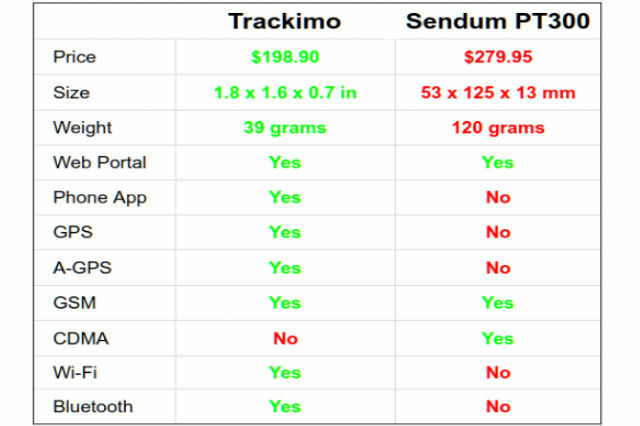 In hopes of making sure that anyone who has something to track can purchase a tracking device that will help them with their task, Trackimo package tracker is only priced at $198.90, almost a hundred dollars cheaper than the Sendum PT300, which is for $279.95. Whether you are a supplier, a carrier, or the consumer, we all have something we want to protect. But as much as we want to keep an eye on our valued possessions manually, human as we are, our capabilities are limited. This is what technology is here for. Today’s market is a powerhouse of technological products designed to make tasks, including tracking, easier. It just all boils down to choosing the right brand to purchase and trust.